A new interactive training course for media and production crews operating in dangerous environments has been launched aiming to provide life-saving skills through dynamic simulations. 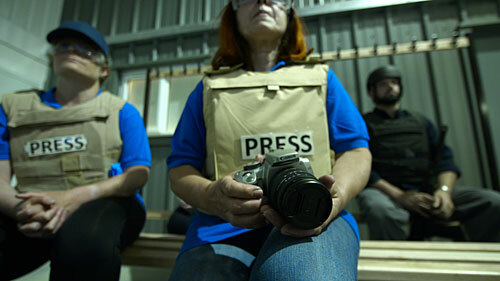 Designed by former Special Forces medical experts at Iqarus, who have decades of experience of supporting media teams, the Media Operations Emergency Training provides the equipment and skills to manage life threatening traumatic injuries and acute illness. According to the International News Safety Institute, more than 100 journalists and media staff have been killed so far in 2016. The specialist training course covers incidents that can be encountered in the field from ballistic trauma and road traffic collisions to climatic injuries, infections and chemical or biological agent release. Course participants receive a bespoke medical kit on completion of the training, linked to a 24/7 doctor on call system for added protection. Capability is developed during the three-day course through practical simulations with course materials and certifications provided along with a comprehensive aide memoir and the ability to dispense certain medications within personal equipment.